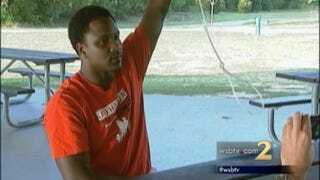 David Mitchell is shown holding up the noose that he says a white UPS driver gave him. An Atlanta man says that tensions got so high between him and a white UPS driver that the driver fashioned a noose out of packing material and handed it to him during an office delivery. According to WSB-TV, David Mitchell said that during a routine workday, which included receiving packages as they come into the office where he works, the white UPS driver, whose name has not been released because UPS is still investigating the incident, began acting strange. "I go pick up, and this is what he made in front of me and handed to me. Signifying a noose. A makeshift noose," Mitchell told the news station. Mitchell said that the driver shoved boxes in his chest prior to fashioning the makeshift noose out of packing material. "It is under investigation, and we are taking this very seriously. We have met with the customer, and there is nothing more to share, since it's still being investigated," a UPS-issued statement read, WSB-TV reports. The Forsyth County Sheriff's Office is investigating the incident as a hate crime. Mitchell told the news station that the beef between him and the driver started to escalate after an incident in the loading dock area a month ago. "He refused to give me the package to deliver, and I said, 'I work here,' " Mitchell told the news station. Mitchell notes that UPS told him that it had reassigned the driver to another route but hadn't issued any serious punishment. "They said it's a 'he-said, she-said,' " Mitchell told WSB-TV. "I don't go to work with makeshift nooses in my back pocket."